Champagne and Chocolate for Two. When a special occasion arises, send your best wishes with the unparalleled gift of Champagne. Fils Gallant North Coast: A superb example of California North Coast excellence, Fils Gallant is produced in small batches using the Methode Champenoise process. Big, bright acidity and a palate cleansing effervescence ideal for pairing with everything from oysters to a Meyer Lemon tart. Moet & Chandon Imperial Champagne: A luxurious, world-famous Champagne that boasts soft white-fruit aromas of peaches and pears and a finish of fresh walnut. The smooth, juicy mid-palate segues to a clean, crisp finish ideal for sipping with a decadent truffle course or raising to toast a momentous occasion. 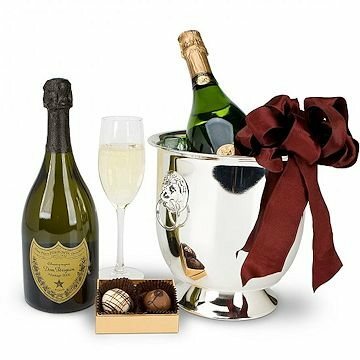 Champagne and Chocolate has been purchased most frequently by our customers for the following occasions: Congratulations, Birthday, Christmas, Anniversary, and Thank You. Glass flutes are for display only and are not included in the gift. Please note that this gift is only available for purchase and receipt by persons over 21 years of age.